Nothing flies by quite like summer! I looked at the calendar today and thought to myself, how is it already mid-July? And more importantly, how am I going to get myself ready for the next school year while enjoying these last few weeks of rest and relaxation? Work smart, not hard. Figure out exactly what you need to be ready to receive a new group of kids to set the tone for your management, your classroom culture, your students’ learning, and your ability to respond to student data. Whew. That sounds like a lot. Here are a few ways to simplify your life. Start by reflecting on last year to gather your lessons learned for this year. Use the tools to take your lessons learned and improve your classroom for the coming year. To top it off, do all this while enjoying these last days of summer. What were your biggest management challenges? Were these challenges you experienced in previous years? How do you want your classroom culture to be different this year than last? What explicit lessons will you teach your first week of school? How will you uphold your expectations from day 1? Clarify your expectations from day 1. Use this customizable bundle of policies and procedures notes, student surveys, templates for management of pencils 🙂 and homework, and a quiz to assess mastery. Use your lessons learned to finalize your policies and procedures in this easy-to-modify template. What do you want students to ideally think and say about your classroom? How will this culture improve learning outcomes? How would you define your classroom culture of years past? Get to know your students in a highly engaging way that replaces the student survey with a game of Scoot. This is a great opportunity to flex your classroom management muscles while getting to know your students’ interests, experiences, and challenges. This ~30 minute activity includes students answering 24 questions about themselves. I keep their responses in a binder and use throughout the year for a variety of lessons and activities. For my own classroom, I’ve spent a lot of time in the last two years trying to figure out what tools I can use on a consistent basis to reinforce student learning with a tool that is familiar to students and easy to use. As you think about student learning in your classroom, think about some of these questions? What types of misunderstandings are you best at remediating? What types of scaffolds have worked well in you classroom in years past? What skills or standards do you struggle to remediate? What types of questions (i.e. directions, content, rigor) do students ask you most frequently? This set of 15 Quick References (AKA Anchor Charts) are my favorite way to scaffold student learning and reinforce key points for a skill or standard. I both blow them up as posters in my classroom and provide them as a one-pager to students. For example, when we are drafting a piece of writing, I’ll have my students take out the Writing Process Quick Reference to use as a reminder of the key stage of writing and what needs to be done in each stage. The Quick References both alleviate the number of questions asked in my classroom and act as a scaffold for more rigorous skills and standards in the era of Common Core. To what extent do your students know their performance and progress towards goals in your classroom? Do students set personal goals around learning in your classroom? Do you provide students with tactical tools to monitor their progress? In the last few years, I’ve tried to brainstorm ways to make goal setting more tactical and personal for my students. For reading growth, my favorite way to do this is with personalized bookmarks that measure Lexile growth based on progress monitoring tests my students took quarterly. Each bookmark includes a quote that I felt described the particular student, and students were responsible for setting a goal (captured on the bookmark) and monitoring progress toward goals. I like this type of tool because it uses goal setting in conjunction with student data. 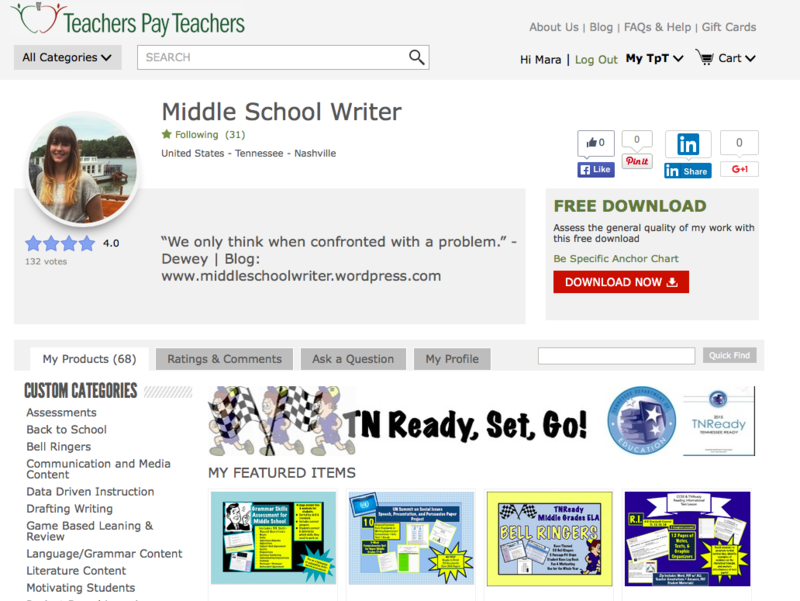 Check out Middle School Writer’s Back to School Pinterest Board here for more back to school tips and lessons!